Love the color combination! The necklace is very cute. Very nice this look, cute necklace! so gorgeous! i love that blazer. Gorgeous outfit. Love the colour of the jacket. Your necklace is super adorable! That necklace and that bag.. ARE YOU KIDDING? I've never seen two things more meant for each other in my life. So beautiful. Love this outfit sosososososoooo much! 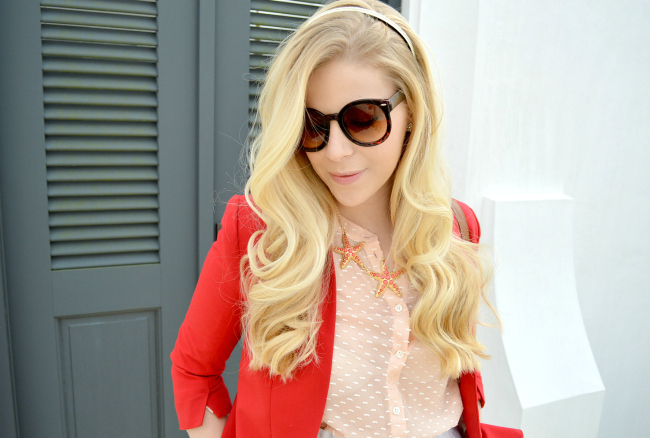 I'm on the hunt for a red blazer and I'm loving this one! That Ted Baker bag is divine! Statement necklaces are so in right now and I love that yours is so summery! Very cute look! Once again, colors looking truly more than lovely! That starfish necklace is gorgeous! Love it! Adore your red blazer and the lucite on those heels... The starfish are too cute! I'm from Florida and I am all about beach accessories. Fabulous look! Such a cute necklace! Love the red and peach paired together...very unexpected but it looks fantastic! LOVE this outfit! 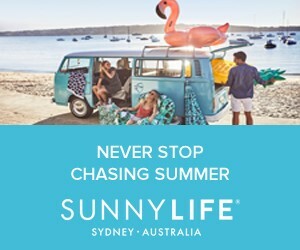 Looks faulous on you! I love how you've paired all of your rings. clearly, you have amazing taste! Love this look! First- love your hair! Looks great! 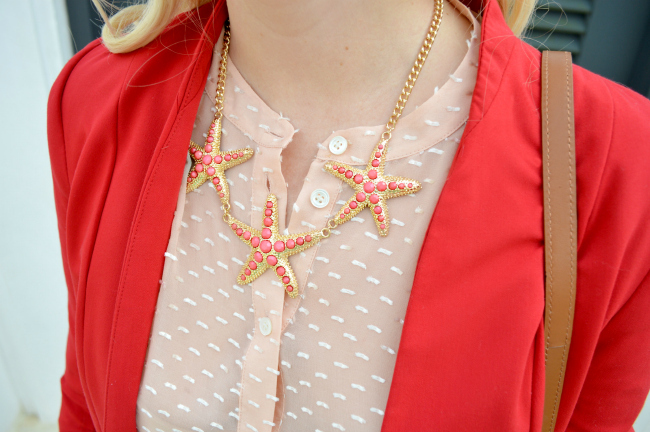 Second- OBSESSED with your starfish necklace! Super cute and definitely makes a statement! As always, you're accessories are spot on. cute top and amazing necklace. Beautiful outfit my dear. I love this necklace and the whole color palette! 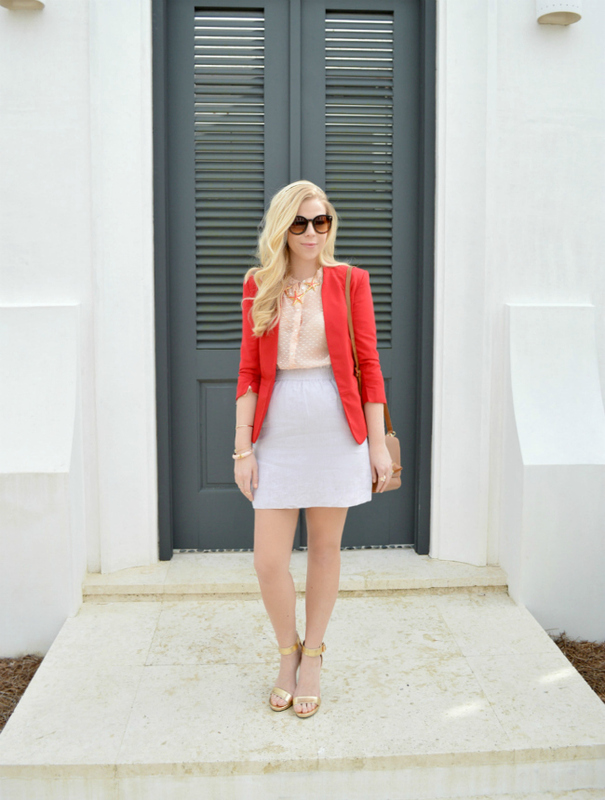 Love this outfit especially the red blazer. Very pretty look, and great accessories. Cute outfit! I love the accessories!! Cute look! 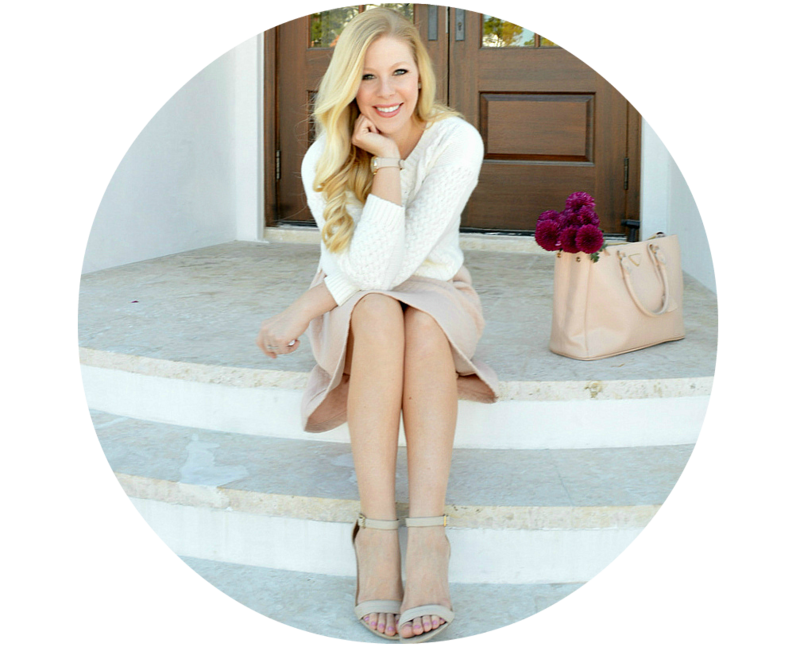 Loving your bag and blouse! Love the blazer!! and the Ted Baker bag is beautiful! adore this entire look !!! !